White half-pigskin over old boards. Member of the de Lisle family; their arms (or, a fesse sable between two chevrons sable) on fol. 19; dedication on fol. 122 written by Robert de Lisle giving the book to his daughter Audere and after her death to his daughter Alborou; Roger de Bettesthorne, 1331; John and Eleanor de Mere, fourteenth century (? ); Emme Drew, fourteenth or fifteenth century (? ); James Spoor, before 1787 or 1789; George Shepherd, 1787 or 1789; Margett Colefer; London, Sotheby's, May 19, 1958, lot 96; purchased there by Arthur Rau, Paris for William S. Glazier (1907-1962), New York; deposited in the Pierpont Morgan Library by the Trustees of the William S. Glazier Collection in 1963. Ms. book of hours for the use of Sarum (Hours of the Virgin, Office of the Dead); written and illuminated in England, possibly York, 1316-1331. 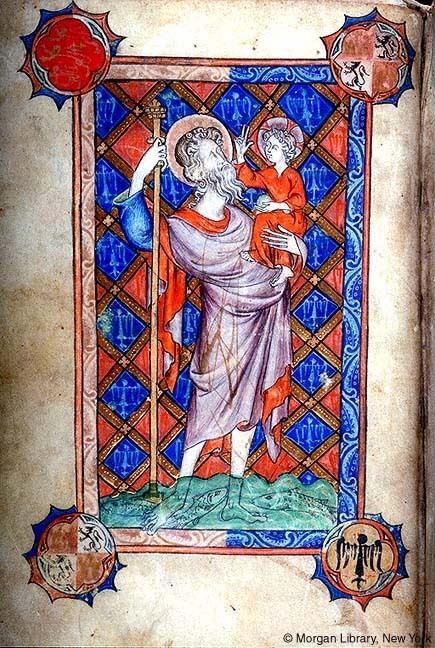 The De Lisle Hours dates between 1316 and 1331 because of the Short Office of the Cross, ascribed to Pope John XXII (1316-1334), on fols. 2v-4v, and the added note on the birth of Roger de Bettesthorne's son, John, 1331, on pastedown on inside front cover. Decoration: 18 large miniatures, 10 historiated initials, 1 historiated margin, numerous decorated initials; this manuscript contains a rare cycle of the Ages of Man, picturing a woman and man conversing, the latter aging steadily.